318 pages | 6 Color Illus. Visible Learning into Action takes the next step in the evolving Visible Learning story. It translates one of the biggest and most critically acclaimed education research projects ever undertaken into case studies of actual success stories, implementing John Hattie’s ideas in the classrooms of schools all around the world. 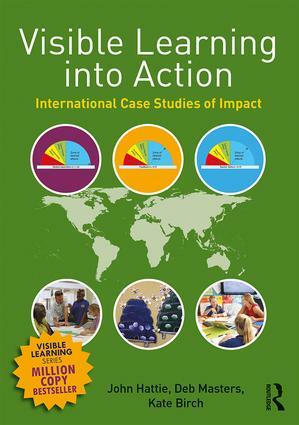 The evidenced case studies presented in this book describe the Visible Learning journeys of fifteen schools from Australia, USA, Hong Kong, UK, Sweden, New Zealand and Norway and are representative of the VL international community of schools in their quest to ensure all of their students exceed their potential for academic success. Each school’s story will inform and inspire, bringing to life the discussions, actions and reflections from leaders, teachers, students and families. Visible Learning into Action is aimed at any student, teacher or parent requiring an up-to-date commentary on how research into human learning processes can inform our teaching and what goes on in our schools. Chapter Eight: Hodge Hill Primary School, England, UK. Chapter Nine: Asgard Skole, Norway. Chapter Eleven: Moberly District, Missouri, USA. Chapter Twelve: Wolford Elementary School, Texas, USA. Chapter Fifteen: Tobermory High School, Scotland, U.K.
John Hattie is Professor and Director of the Melbourne Education Research Institute at the University of Melbourne, Australia and chair of the Australian Institute for Teaching and School Leadership. He is the author of Visible Learning, Visible Learning for Teachers, and Visible Learning and the Science of How We Learn, and co-editor of the International Guide to Student Achievement. Deb Masters is a principal consultant at Cognition Education and the Global Director of Visible Learningplus. She has established the internationally-acclaimed Visible Learningplus school change model. Kate Birch is an education consultant in the Visible Learningplus team at Cognition Education. She also works as an independent literacy consultant in schools. Why not download our Routledge FreeBook Know Thy Impact: Visible Learning in Theory and Practice? This resource comprises a carefully curated selection of chapters from John Hattie’s groundbreaking work in education and classroom practice, including a chapter from Visible Learning into Action.